The VIP style is quite tempting, but Kelvin warns that it isn’t cheap. 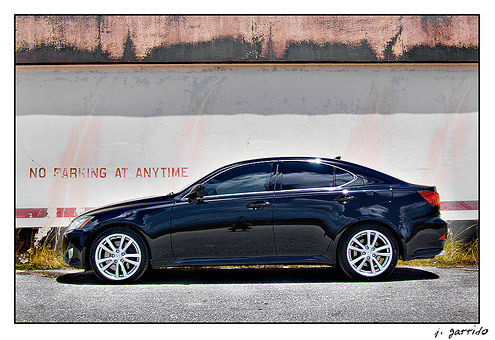 Even though you can pick up a used GS 300 for around $15,000, the right parts will cost you nearly double that. You can check out the full article and more photos @ Superstreet Magazine. 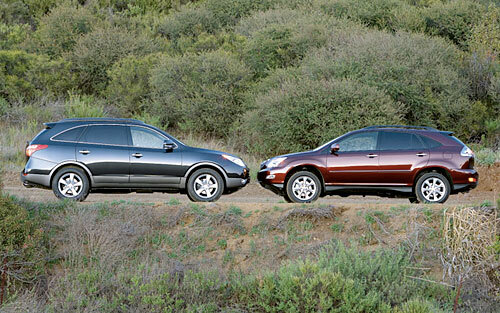 It should be common knowledge that the Lexus RX 350 and the Hyundai Veracruz Limited are in different classes, bought by different people for different reasons, but that didn’t stop Motortrend from comparing the two vehicles in their latest issue. Let me save you the farce, the Veracruz is declared the winner of the two, simply by placing inordinate weight on a questionable concept of value. Compared, the Hyundai rings in at $10,000 less than the Lexus, yet it lacks a navigation system, a backup camera, adaptive HID headlights, to speak nothing of the lower interior quality. These are not small differences: the Navigation feature alone would add $1500-2000 to the price of the Vercruz — that is, if it was even available as an option. Is the Hyundai chassis that much superior? No. It’s the RX’s insistence in keeping you overly safe that electronically inhibited its performance. It sensed that our max-handling performance testing was impending accident doom and lit up the stability controls at anything more than the slightest provocation. Beepers beeped, brakes braked, and the throttle was dialed out until the RX 350 knew we weren’t going to crash. This also was the case on our mountain road loop, even during moderate cornering. The Lexus computer wizards need to dial the electronannies back a notch or two. Makes absolutely no sense to me, this vehicle isn’t a sports car, it’s a people mover. Wouldn’t the additional safeguards be considered a plus rather than a minus? Really, dragging the RX 350 into a comparison with what is essentially a cheaper knockoff, then basing the final verdict strictly on “value”, seems inappropriate for a major car magazine. How would the Veracruz compare to the BMW X3, I wonder? 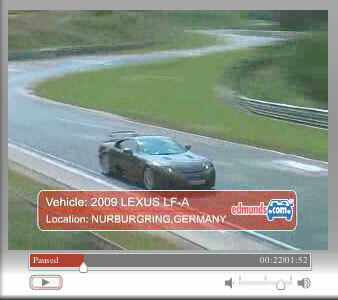 Seeing the supercar in motion is much more impressive than the spy photos, the speed is positively overpowering. Judging from the roar, the LF-A will be running a V-10 engine. The intake ducts integrated into the C-pillar and rocker panels could cool a rear-mounted battery pack, which would allow for a hybrid powertrain. The supercar is using an automated sequential manual gearbox, which presently sounds a little rough around the edges. No word yet whether this car will be unveiled at Frankfurt Auto Show in September or the Tokyo Auto Show in October. Really, all humor aside, this is a beautiful photo, the detail and processing are impeccable and it’s certainly one of the best “new car owner” photos I’ve come across. Wonderful job. A nice sentiment, I suppose, but this type of celebrity appropriation never sits too well with me.